As I mentioned in my Hello World post it’s important for the choice to go with Tesla to make some kind of sense. I struggled with the math and finding the correct data and i’m not sure its all correct at this point so any feedback is more than welcome. While the cars are totally different, my choice on getting a replacement car right now would be another Acura MDX or a Tesla Model S. The MDX has been a great car and I don’t really see anything better in the ICE world that would be interesting right now. We’ll get into options/configuration in another post but generally, despite what the auto manufacturer websites say, you only get the choice of a stripped down model or a fully loaded model so on my ICE cars i’ve always gotten the fully loaded version. With Telsa (thankfully given the fully loaded price) you can actually get just the options you want as each car is custom built to your order. The price and rebate sections are pretty self-explanatory. Since I live in MA, only the Federal $7,500 tax credit is available. Also beware that you get that back (or credit) at tax time, so you’re still out that extra $7,500 initially (you have to pay for/finance the full amount less your deposit). The price is just with the options as described above. I’ll get into what i’m picking for the Model S in a later post. Next is the MPG for the newer MDX (much better than my 2007 model) and the MPGe rating for the Model S. The MPGe rating isn’t used in any calculations. The fuel cost varies (and is different from my other post) — gas price is a rapidly moving target based on a lot of sentiment whereas electricity prices vary less. I’m averaging between 32K and 35K miles per year. I plugged 35K. For the watt-hour per mile this is an estimate. Its going to depend on driving style, driving aggressiveness, terrain, traffic, weather, and many other factors. After reading a lot on the Tesla forums I came up with this guesstimate. Some have a lot less, some have a lot more. For most people this will start out high and come down over time. Between learning the car and software updates I figure this may be a good 7 year average number. Time will tell on that. Next you’ll see price per KWh. Where I live its $0.167/KWh which is much higher than the national average of $0.12 and even the MA average of $0.146. The chart on this page shows that New England is among the most expensive areas for electricity (perhaps also a reason Tesla has a light presence here). This cost didn’t help the analysis/justification any. A future move may be to add solar to my property. The next line converts energy cost into an energy cost per mile then multiplies that by miles per year to get total energy cost per year. Using this math Gas is 2.75x more expensive than Electricity (and thats the most expensive premium Gas vs my crazy expensive electric). Its been rising over time with an average of $0.04976/mile over the last 6 years. Much of that has been ICE related issues (oil, check engine, belts etc). 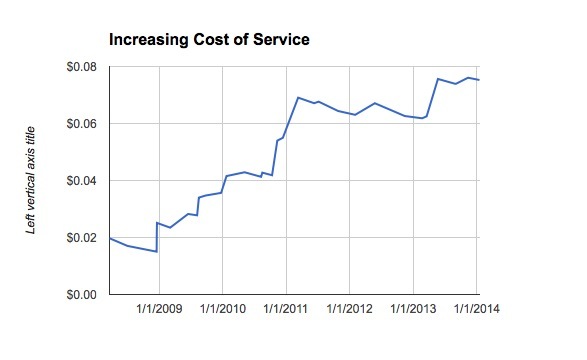 There’s not much to go on for how much Tesla service will cost other than the optional annual service of $600. While they say every year or 12,500 miles does that mean I should get two services a year? Something to look into later. Finally multiplying the annual costs of fuel and service and adding in the purchase price plus any rebates got me to the true cost to own for me of the MDX vs Model S. Perhaps it was wishful thinking that got me here but somehow i’m less than <0.5% difference between the two. Some rumors say the Model S will chew through tires faster. I suspect I won’t get 54K miles on a set of tires. It looks like the reps are quoting 30K on a set of tires so there’s some added tire costs for the Tesla. I didn’t look at the individual tire price differences. There’s going to be some setup of electrical service in my garage for the Tesla. There’s already a dryer plug in the garage and I have 400A of service on my property but some electrical work will be necessary which adds to the upfront/one time costs. I haven’t yet looked into insurance differences between the two cars. My guess is they’re fairly comparable right now. If I can install solar on my property and get a net return on that it could drive some of the energy cost down further. Thats going to take some research/time. I’m assuming the 2014 MDX is as well made/will do as well as the 2007 model. Thats probably a good bet. Since I live in New England, there are going to be times I have to drive a SUV to work or on long trips where I don’t want to go out of my way just to get charged up. That reduces the benefit of the Tesla somewhat but is limited to the few times that happens in a year, perhaps 5-10% of the total miles. As I get some answers to some of the above i’ll post some updates. Meanwhile if you see any errors in the logic, let me know. Your miles/year should be reduced (for the cost calcs) by the distance in l.d. travel, using the free SuperChargers, increasing as more become available. The national average is 30% of total miles. What do you mean by I.d. Travel? Why would I drive less? I think he means if you will be doing long-distance drives utilizing SuperChargers, you should reduce your mileage for the purposes of calculating ‘fuel’ costs, since you aren’t actually paying for fuel for the miles charged up via SuperCharger. 1. You may be generous with the MPG of the Acura. It’s rated at 18 city/27 highway (for the V6 AWD 2014 model), so you’re implying you can hit the highway number, on average. In New England I never came near that in my Audi, between the cold weather and traffic congestion. YMMV. 2. The Model S has much more storage space: 31.6 cu ft with all seats in place, vs. 15.8 cu ft for the Acura. If you only need to seat two, though, the Acura has more space (90.9 Acura v. 63.4 Tesla). 3. The Acura seats 7 adults (kinda); the Tesla seats 5 adults (comfortably) and 2 young’ns (though the +2 comes with a significant reduction in cargo capacity). 4. The Model S is a much more engaging vehicle to drive. Acura’s done a great job with the MDX, with a 0-60 time of 6.4 sec and 0.85 g skidpad (per Car and Driver). But the same source gives the Model S a 4.6 sec 60 and 0.91 g skidpad. And, the car *wants* you to do these things. The Model S is a practical luxury sportcar; the MDX is a sporty luxury SUV. Different things. 5. The Model S is the safest car on the road. The MDX is a safe SUV, but not the safest SUV and clearly worse than the Model S in rollover performance. If all comparisons were made on cost of operation, we’d probably drive something made in eastern Europe with 100k miles on it. So, what value do you place on other features? If you really like the AWD SUV format, perhaps the Model X is the car for you. 1) Thats a good point. My 2007 MDX is rated 17/22 and I get 20 so i’m close but not at the 22. 2) Cargo room, another good point. Wasn’t looking at seats up vs down. 3) The Acura 5+2 is a decent +2. I sit teenagers in the +2 spots all the time. Couldn’t do that in the Tesla. 4) Understood. I don’t need the sport part of it but i’ll take it. 5) The MDX definitely gets good ratings and the Model S has done amazingly well. The MDX has also stood the test of time and the Model S has yet to prove that. I already decided on the Model S, delivery on 4/25 (just over 3 weeks…). I’m sold. The main point of the post was to convince myself it sort of made sense to buy a Model S which I did and you just helped even more. 1. Depreciation: The Model S is still a new car, so it’s difficult to predict the exact depreciation over 7 years. Even assuming a lower depreciation for the Model S, since on average a car is worth only ~15% of it’s initial price after 7 years, there is bound to be quite a significant gap in between the two cars. 2. Battery degradation: Again, the Model S is a new car and there isn’t much data available on this, but just think of the battery in your 3-4 years old laptop or smartphone. It’s highly probable that in 7 years the range obtained from the 85 kWh battery pack will be significantly lower than the one obtained from a new 60 kWh battery pack today. For sure battery prices will go down significantly especially after the Gigafactory goes online, but even so that reduced range it’s sure to take a bite on the resale price. Good comments. 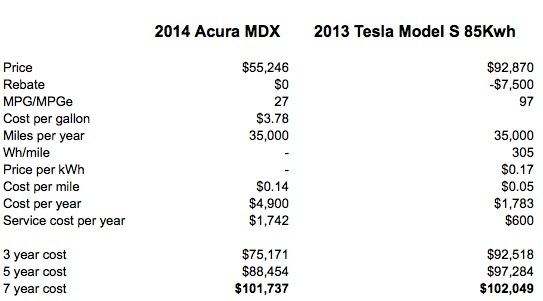 For depreciation the issue is the same for the MDX as well a the Tesla. I don’t know why you’d assume there’s a significant gap between the two. On the battery degradation, the 85kWh battery is guaranteed for 8 years unlimited miles. After 7-8 years and 200K miles few cars hold much value at all. My 7 year old 2007 Acura is worth $12K on a trade in. I’m not sure a Tesla Model S 7 years from now would be worth less than that. My point exactly. After 7-8 years and 200K miles none will hold much value. If your 2007 Acura is worth $12K now and assuming it was $55K new, it means that it lost $43K in depreciation. Now assuming that the Model S will be worth $20K in 7 years (which is really a big overstatement), it would lose $73K in depreciation, $30K more than the Acura. As for the battery, after 7 years it will be nearing the end of the warranty period. With the inherent degradation that it will show and with it nearing the end of the warranty period, that’s sure to affect the resale value (so the depreciation loss above will be even higher). That logic leaves out the benefits of electric vs gas in terms of cost as well as the engine maintenance factors. Thats the point of the post. I’m fine assuming both cars have no value at 7 years/200K miles and then looking for the equivalent costs over that same period. TMan, not a solid argument when you say ‘I’m fine assuming both cars have no value at years/200k miles’. You’re burning down a bigger chunk of $ over those seven years with a Tesla vs an Acura (92k vs 55k). It’s a difference of about 50k. How come you’re not factoring that in your TCO calculations? The cost of each car was included in the calculation. Good post, thanks. Should note you’re estimate for electricity useage is going to be low – you don’t account for charging loses from the wall to the car or other non driving electricity loses. Thanks. I’ve been trying to figure out how to better calculate the real usage short of adding a meter to the plug. Any ideas? A meter would be the best way… Do you have your old electric bills? If so, you could compare May vs May and divide the difference. Or maybe do an energy audit – identify all your source of usage, total them up and then compare vs your energy bills. Or you could use something like this: http://yeroc.us/calculators/wire-resistance if you know the distance from your breaker box to where the car will be charged (that would only be for the wire – not for the on board charger). For example a 6 gauge wire with a 100′ round trip would waste 1.479 Kwh of energy over 24 hours assuming 40 Amp current. Any thoughts on Service Plans vs. the Extended Service Agreement? Your articles are always well thought out and reasoned so I’m curious what you’ve decided to do. Thanks, I definitely need to look into that since you only have 30 days post-delivery to make a decision if you want to do something. I’ll be researching soon! What is really missing in the calculation is the alternative cost. The difference between the price of the Tesla and the Acura could be invested in say the stock market at an average of 7% return on investment. Of course depending on the year 7% may be -7% so you’d really want a more conservative/risk free investment for a decent comparison. Agree that the potential cost of home electrical for the tesla needs to be factored in. The existing amperage on my older home was not sufficient to support the load of a new 240 plug without an expensive upgrade. Worth checking with an electrician first to understand the total cost of your own home’s setup, which can vary widely. Second, your list of benefits doesn’t include time saved. In California, electric vehicles are HOV lane eligible, which shaves time off a work commute in both directions. You also save time not doing maintenance, smog checks, and gas station stops. Assuming 5 to 10 years of car ownership, that time adds up fast! The time savings would be less, of course, if a driver routinely travels long distances and needs to supercharge. Thanks. There are no HOV lanes here in MA. We also have to get EVs inspected as often as ICE cars so no savings there. True on saving time stopping at gas stations but if you do any long distance travel that savings is easily eaten up by supercharger stops as they eat quite a bit of time as you implied. The cost comparison here is very misleading. I’m a Tesla fan so please don’t get me wrong but there are some incorrect assumptions here. You do not need to pay the $4K. You can pre-pay for service or an extended warranty but I did neither. Also when the post was written annual services were $600 each time. Now they vary but i’ve never been charged more than $600 (2 annuals so far).